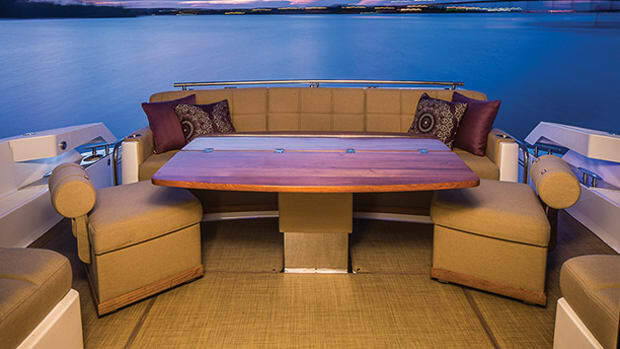 When it comes to keeping your boat cozy, you can’t beat a cabin heater. But installing one isn’t as simple as you might think. Autumn’s here, nights are getting cooler and northerners are thinking of either cruising south or putting their boat on the hard in preparation for winter. Why? Fall is one of the nicest boating seasons in New England, the Great Lakes, the Pacific Northwest, and in lots of other seasonal climes. Anchorages that were packed during the summer are now almost empty, marinas in trendy waterfront towns have plenty of open slips, and when the leaves turn color, the shoreline becomes a panorama of red, orange, and gold—nothing beats leaf-peeping from the water. So why miss out on this, just because the temperature’s dropped a few degrees? Install a cabin heater, and spend clear, crisp autumn nights onboard, snug as the proverbial bug in the rug. For many of us, the easiest and cheapest way to boost the Fahrenheit readings belowdecks is to flip the air conditioner to reverse-cycle; in the fall the water’s still warm enough for that system to work. Or we could plug in a portable electric heater designed for marine use: West Marine sells one for about $100 that they claim puts out 5,200 Btus per hour at its maximum, 1,500-watt setting. (In general, for an electric heater, watts x 3.41 = Btus per hour.) Both solutions require 120 volts, and that means running the genset if you’re away from the yellow cord. If you cook with electricity, by the way, you have enough genset muscle to power a portable heater once the galley stove’s shut down. Of course, if you’re planning on exploring fjords at Christmas, or live in Alaska, you’ll need a serious heating system. 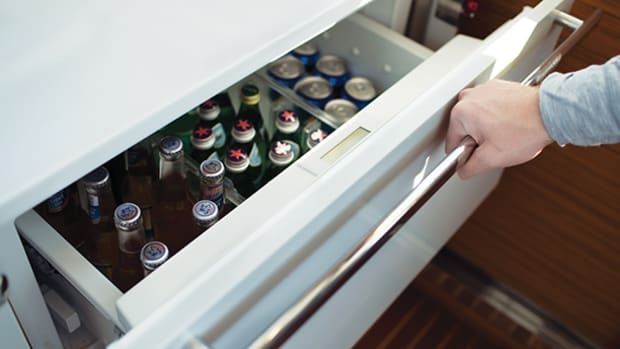 Cold-water voyagers install diesel-fired furnaces in their engine rooms or other machinery spaces to heat the air, and ducts and fans to distribute it to the saloon and staterooms. Some folks prefer hot water piped to radiators in each cabin, just like at home; the upside is, such folks always have plenty of hot water for showers, too. Hot-air and -water systems, however, are both tricky to install, due to the difficulty of retrofitting ducting and/or plumbing. It’s a job best delegated to a skilled technician, one with ABYC certification who will adhere to the appropriate standards. Webasto (www.webasto.com), Eberspaecher/Espar (www.eberspaecher.com), and Wallas (www.scanmarineusa.com) build hot-air and hot-water heating systems. But there are other paths to warmth: How about a cabin fireplace? Old-timers cured the shivers with a wood- or coal-burning stove, usually the same one used for cooking. Yacht designer George Buehler says the traditional solution in the Pacific Northwest “used to be a diesel-burning cook stove, left on for eight or so months of the damp cold weather.” A diesel-fired cabin heater will do the same thing, although most of us won’t burn it for quite so long. Some skippers prefer propane to diesel, however, and a few burn kerosene. (Most diesel stoves can be converted easily to burn kerosene.) But don’t overlook a solid-fuel stove for occasional use: Installation is easier, since no fuel supply is needed—just toss in some charcoal briquettes or a few slices of Pres-to-Log. 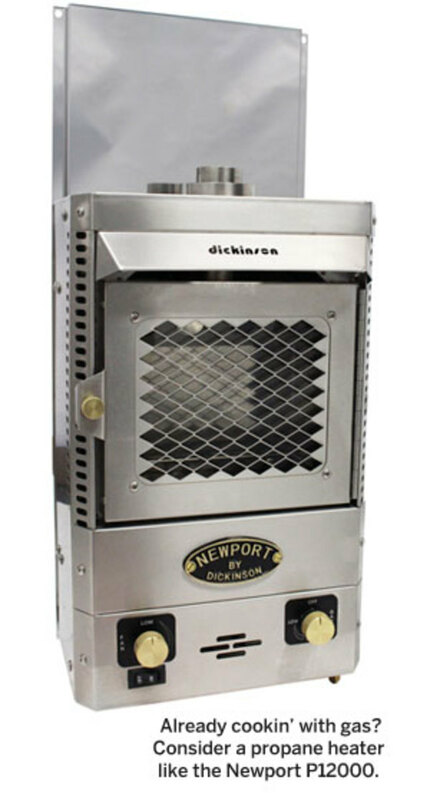 Dickinson Marine (www.dickinsonmarine.com) manufactures a variety of cabin heaters and stoves burning diesel, propane, and solid fuel. One Btu—British thermal unit—is the energy needed to heat, or cool, one pound of water by one degree Fahrenheit at one atmosphere of pressure. There’s an oft-quoted formula for estimating how many Btus per hour you need to warm a room or a cabin: Multiply the volume of the space by a constant—14 if it’s well-insulated, 18 for poor insulation, or somewhere in between, depending upon your talent for guestimation. Using this formula, a 10-foot-wide by 12-foot-long by 6.5-foot-high saloon, well-insulated (constant = 14) needs 10,920 Btus per hour of heat. That formula, though, is for heating a room to a comfortable temperature in the dead of winter. 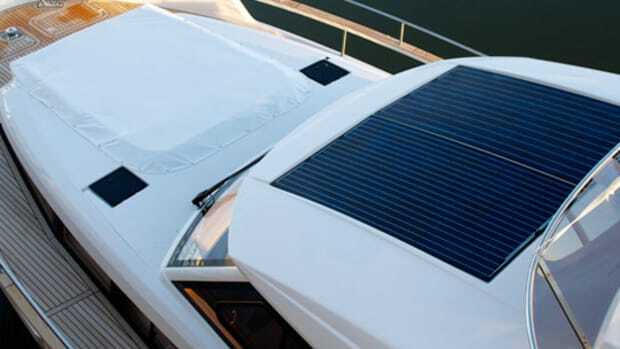 For autumn cruising, we need boost the cabin temp only 15 or 20 degrees over the outside air, so you don’t require nearly as much Btu capacity. The calculator at www.calculator.net/btu-calculator.html lets you plug in the desired temperature increase, and will produce a more accurate heat requirement, one that’s a lot lower than you get from the standard formula. 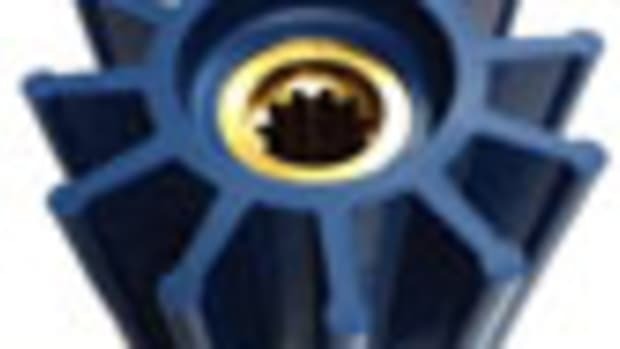 Using the same dimensions as above, and with a target temperature increase of 20 degrees Fahrenheit, the heat requirement drops to 1,948 Btus per hour. How much heat can you get from a cabin heater? 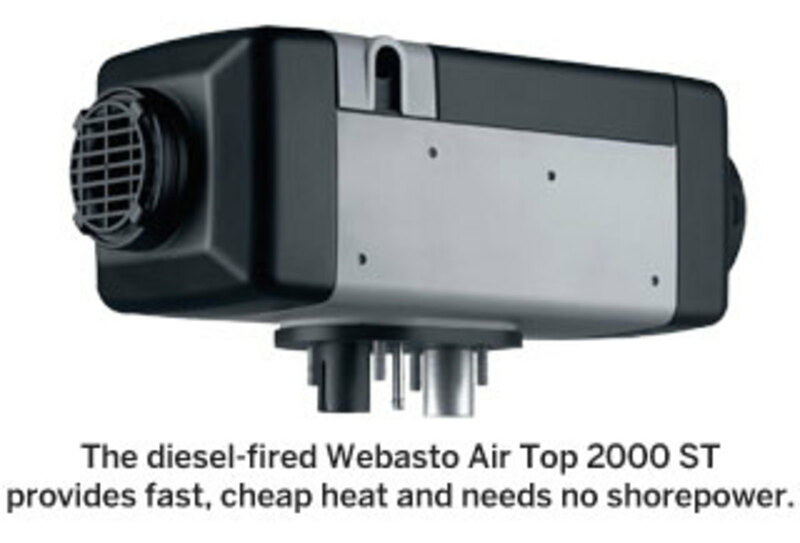 Diesel is the warmth winner: Dickinson’s Newport bulkhead-mounted diesel heater produces a whopping 16,250 Btus per hour at its high setting, while burning 3.2 gallons of fuel per 24 hours, and, at its low setting, 6,500 Btus per hour while burning 1.29 gallons per 24 hours. The company’s propane-fueled P12000 heater produces 5,500 Btus per hour on high, 4,000 Btus per hour on low, and will run for 5.5 hours and 3.9 hours, respectively, on one pound of propane. 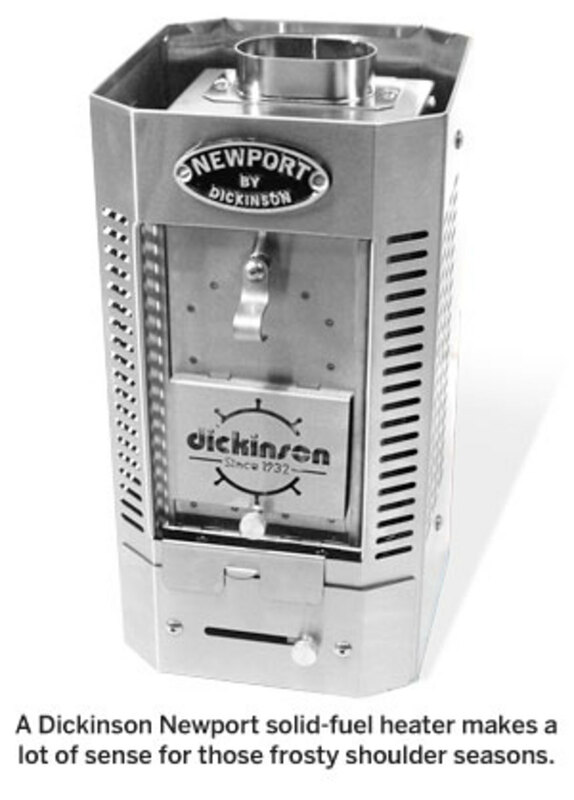 Dickinson’s Newport Solid Fuel Heater produces up to 8,000 Btus per hour for up to four hours, depending on the fuel and damper setting. It can burn wood, coal, or charcoal; anthracite coal burns a little hotter than charcoal, and both burn much hotter than wood. You probably have some charcoal briquettes onboard already to feed the barbeque, so why not heat the cabin with them, too? 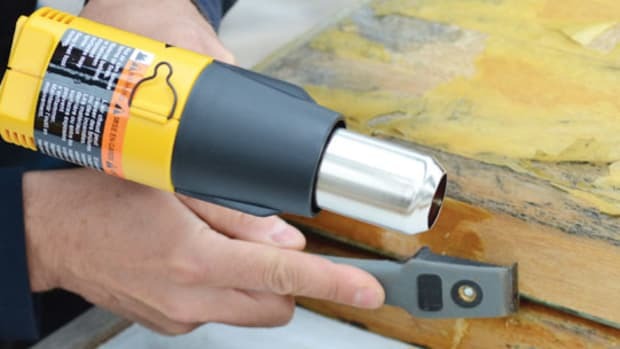 The American Boat and Yacht Council (ABYC) has changed its requirements for carbon monoxide (CO) detection systems, according to Matthew Weinold, education development manager of the ABYC. 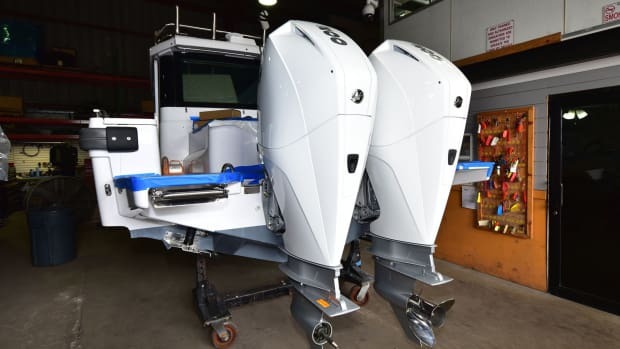 The new rules are effective immediately, but boatbuilders have a year to incorporate them into new boats to maintain ABYC compliance. The updated Standard A-24, Carbon Monoxide Detection Systems now requires virtually every boat with a cabin to have a carbon monoxide detector. Although CO detectors have been a requirement on boats with enclosed accommodation compartments for a long time, there was always an exception for diesel and outboard boats. 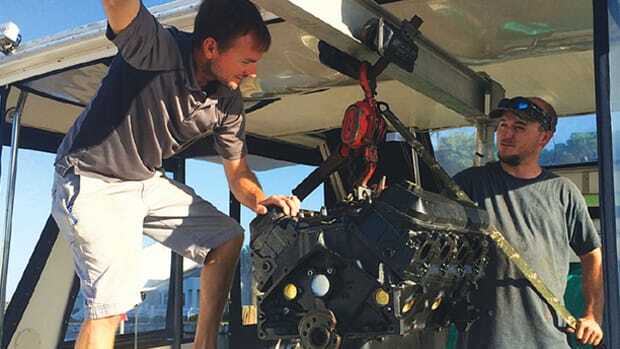 The theory was that diesels produce less CO in their exhausts than gasoline engines, and outboard exhausts are essentially outside the boat. That exception has been removed, making CO detectors a requirement on ALL boats with enclosed accommodations, regardless of propulsion type. Why? 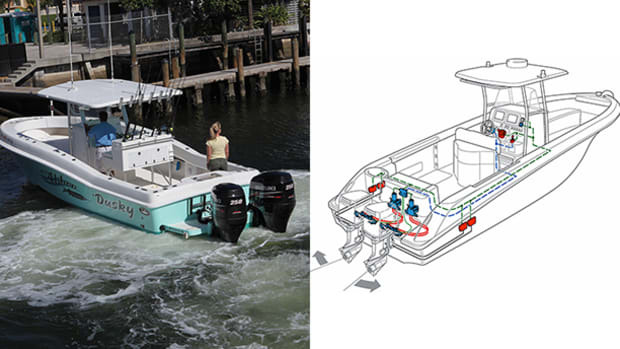 There have been CO poisonings, some resulting in fatalities, in raft-up and slip situations where exhaust from a generator running on a neighboring boat was pulled into an open hatch of a boat not required to carry CO detectors. Even if your boat doesn’t fall under the above definition, if there’s an enclosed area you spend time in, we recommend installing a CO detector. Fireboy-Xintex (www.fireboy-xintex.com), among others, sells sophisticated carbon monoxide detectors for marine use. They cost much less than a funeral. If you cook or heat with LPG,consider installing a propane detector, too. It’s likely that the fuel you have onboard already will play a big role in determining what cabin heater to buy. If you already cook with gas, it’s relatively easy to add a manifold at the propane tank and run a separate gas line to the fireplace; you can’t tap off the stove supply. Michelle Parry from Dickinson Marine says the propane heater is the cheaper option, since the price (the Newport P12000 costs $1,178) includes all the necessary parts, other than the propane hose and fittings: The mounting plate, double-walled chimney pipe (combustion air is drawn in from outside through the outer pipe and exhaust is vented through the inner one), and deck fitting all come with the fireplace. A propane heater is also easiest to use—you just light it like a stove, while diesel heaters need pre-heating and solid fuel is sometimes difficult to ignite. Bear in mind, however, that installing a propane system from scratch involves adding a vapor-tight locker for the LPG tank that drains any leaked fumes directly overboard. (Propane is heavier than air, so fumes that escape inside the boat will end up in the bilge—not good, given the explosive nature of LPG.) Engineering this locker is a complication and expense not many folks want. And refueling propane involves disconnecting the tank, carrying it to a refilling station, and then lugging it, now heavier since it’s full, back on board. The diesel fireplace requires a 3-inch-diameter stainless-steel chimney to vent combustion gas. And the chimney will affect the way the unit performs, explains Parry: “The straighter and longer the chimney, the better,” she says, up to about 10 feet. “Any longer would create too much draft.” Since the air intake is supplied from inside the cabin, there must also be good ventilation in the boat. But hey, that sounds like it’s pretty close to what we need. Where do I get the best charcoal?